Objectives Polyploidy is a fascinating characteristic of liver parenchyma. Hepatocyte polyploidy depends on the DNA content of each nucleus (nuclear ploidy) and the number of nuclei per cell (cellular ploidy). Which role can be assigned to polyploidy during human hepatocellular carcinoma (HCC) development is still an open question. Here, we investigated whether a specific ploidy spectrum is associated with clinical and molecular features of HCC. Design Ploidy spectra were determined on surgically resected tissues from patients with HCC as well as healthy control tissues. To define ploidy profiles, a quantitative and qualitative in situ imaging approach was used on paraffin tissue liver sections. Results We first demonstrated that polyploid hepatocytes are the major components of human liver parenchyma, polyploidy being mainly cellular (binuclear hepatocytes). Across liver lobules, polyploid hepatocytes do not exhibit a specific zonation pattern. During liver tumorigenesis, cellular ploidy is drastically reduced; binuclear polyploid hepatocytes are barely present in HCC tumours. Remarkably, nuclear ploidy is specifically amplified in HCC tumours. In fact, nuclear ploidy is amplified in HCCs harbouring a low degree of differentiation and TP53 mutations. Finally, our results demonstrated that highly polyploid tumours are associated with a poor prognosis. Conclusions Our results underline the importance of quantification of cellular and nuclear ploidy spectra during HCC tumorigenesis. Polyploidy, the existence of cells containing more than two homologous sets of chromosomes, is a well-known feature of mammalian hepatocytes. Polyploidy is defined on the basis of the DNA content of each nucleus (eg, 2n, 4n, 8n) called nuclear ploidy and on the number of nuclei per cell called cellular ploidy. The liver is the unique organ that modifies its ploidy content during normal homeostasis, regeneration and under damage insults. Binuclear polyploid hepatocytes are the major components of the polyploid fraction in normal human liver parenchyma. Quantification of cellular and nuclear ploidy is sufficient to distinguish between normal liver parenchyma and hepatocellular carcinoma (HCC). TP53 mutation is a factor accounting for a higher percentage of mononuclear polyploid hepatocytes when compared with both TERT promoter and CTNNB1 mutated HCC tumours. Highly polyploid HCC tumours are associated with worse prognosis. Quantification of cellular and nuclear ploidy spectra could be an accurate test for HCC prognosis. Polyploidy is a defining feature of the liver.2 Polyploid hepatocytes are characterised by the number of nuclei per cell named cellular ploidy (mononuclear/binuclear hepatocytes) as well as the ploidy of each nucleus named nuclear ploidy (diploid, tetraploid, octoploid nucleus). In rodents, hepatocytes are mainly tetraploid (binuclear with two diploid nuclei or mononuclear with one tetraploid nucleus) and octoploid (binuclear with two tetraploid nuclei or mononuclear with one octoploid nucleus).10 During postnatal development, a scheduled division programme characterised by cytokinesis failure results in the genesis of binuclear tetraploid hepatocytes, which subsequently play a pivotal role in liver polyploidisation.11 12 This physiological polyploidisation is now considered as a form of liver maturation.2 13 Different studies have demonstrated that hepatic polyploidy can be also modified under stress settings as metabolic overload, DNA damage and chemical-induced liver injury.14–16 Recently, we identified a new mechanism regulating polyploidy during liver disease, where in the setting of non-alcoholic fatty liver disease (NAFLD), nuclear ploidy is altered with the genesis of highly mononuclear polyploid hepatocytes.17 18 We demonstrated that this pathological polyploidisation is promoted by endoreplication cycles.17 18 Interestingly, endoreplication is now considered as an alternative division programme in a context of genomic stress.3 It is important to note that a long-term consequence of switching to the polyploidisation mode during liver pathological growth is still under debate. Whether or not polyploidy is a risk factor or protective against human liver cancer is largely unknown. Hepatocellular carcinoma (HCC) is one of the most deadly cancers worldwide and has no effective treatment.19 More than 90% of HCCs in western countries develop on a cirrhotic background as a result of chronic HBV or HCV infection, high alcohol intake, haemochromatosis or NAFLD. A better understanding of the early events of liver carcinogenesis will help outline the pathogenesis of the disease, and improve diagnostic procedures and curative treatment. 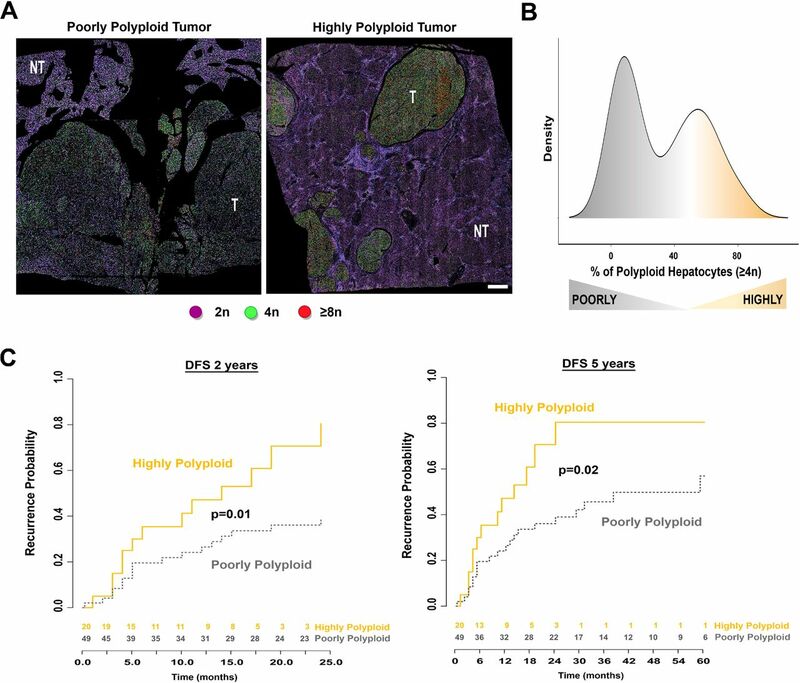 In this study, we aimed to determine whether polyploid spectrum could constitute a potent prognostic marker of human HCC. Polyploid hepatocytes have been extensively characterised and recent studies in mouse models have defined their implication in liver homeostasis.2 5 13 Data on human hepatic polyploidisation are more limited. In this study, we first investigated whether human liver polyploidy originates from the accumulation of binuclear polyploid hepatocytes and/or the accumulation of mononuclear polyploid hepatocytes. Labelling of nuclear (Hoechst) and plasma membrane (β-catenin/KL1) compartments was performed to investigate cellular ploidy (mononuclear/binuclear fraction) (figure 1A). As previously described, nuclear ploidy was determined by measuring the nucleus area.18 20 21 Using a specific imaging program, we assigned a colour code to each nuclei contingent (2n, purple; 4n, green; ≥8n, red), allowing a better visualisation of nuclei within the liver parenchyma (figure 1B). First, we analysed the global ploidy distribution (cellular/nuclear) in normal human liver samples (n=13) (table 1). The fractions of 2n, 4n (binuclear 2×2n, mononuclear 4n) and ≥8n (binuclear 2×≥4n, mononuclear ≥8n) hepatocytes were 73.5 (±3.12)%, 21.7 (±2.18)% and 5.43 (±1.48)%, respectively (figure 1C). We next assessed whether polyploid hepatocytes are preferentially mononuclear or binuclear cells. In normal liver parenchyma, 55% of polyploid hepatocytes are binuclear indicating that cellular ploidy was predominant (figure 1D). Considering the binuclear contingent, we revealed that these hepatocytes were mainly tetraploid (figure 1E). Although the mononuclear polyploid contingent was also essentially tetraploid, we noticed a specific enrichment of octoploid fraction compared with binuclear population (figure 1E). Finally, we observed that ageing has no effect on both cellular and nuclear ploidy spectra (table 1, online supplementary figure S1). Cellular and nuclear ploidy: distribution and zonation in adult human liver lobule. (A) Images of human liver section immunostained with pan keratin/β-catenin (plasma membrane labelling, green), glutamine synthetase (centrilobular zone labelling, red) and Hoechst (nucleus labelling, blue). Liver lobules were divided into three regions (periportal (PP), mid-lobular (ML), centrilobular (CL)) as indicated (merge image). Cellular and nuclear ploidy profiles were quantified in each zone (scale bar: 200 µm). Magnification image highlights binuclear and mononuclear hepatocytes (* indicates binuclear hepatocytes) (scale bar: 40 µm). (B) Images of a nuclear ploidy map: nuclei are artificially coloured according to their ploidy content: 2n/purple, 4n/green, ≥8n/red. Centrilobular zones appear as white staining (scale bar: 40 µm). Higher magnification images: scale bar=150 µm. (C) Global ploidy (cellular and nuclear) distribution in adult livers (n=13): 2n hepatocytes, 4n hepatocytes (binuclear 2×2n and mononuclear 4n), ≥8n hepatocytes (binuclear 2×≥4n and mononuclear ≥8n). (D) Distribution of binuclear (purple: binuclear 2×2n and 2×≥4n) and mononuclear (blue: mononuclear 4n and ≥8n) fractions in normal human livers (n=13). (E) Binuclear polyploid fraction (light purple: 2×2n, dark blue: 2×≥4n) and nuclear ploidy content in mononuclear fraction (light blue: 4n, dark blue: ≥8n) in normal human livers (n=13). (F) Quantification of diploid hepatocytes according to human liver zonation (centrilobular [CL]/mid-lobular [ML]/periportal [PP] regions). (G) Quantification of mononuclear polyploid hepatocytes (4n, ≥8n) and binuclear polyploid hepatocytes (2×2n, 2×≥4n) according to human liver zonation (CL, ML, PP regions). Data were compared using Kruskal-Wallis test. GS, glutamine synthetase; ns, not significant. Studies in rodents have demonstrated that there is a dynamic change in the spatial distributions of polyploid classes across the liver lobule.21 22 Here, we investigated whether this was also relevant in human liver parenchyma. Notably, liver zonation is reflected by the heterogeneity of hepatocytes along the porto-central axis of the liver lobules. Importantly, periportal hepatocytes do not express the same metabolic enzymes compared with pericentral hepatocytes.23 24 Glutamine synthetase (GS) immunostaining was performed to visualise pericentral hepatocytes (figure 1A). Porto-venous axis was arbitrary separated: centrilobular, mid-lobular and periportal regions (figure 1A). We first observed that a similar proportion of diploid hepatocytes are present in the three regions (figure 1F). Moreover, our analysis showed that neither mononuclear (4n, ≥8n) (figure 1F) nor binuclear (2×2n, ≥2×4n) (figure 1G) polyploid hepatocytes have specific zonal distribution in hepatic lobules. Altogether, these findings show that human liver polyploidy is mainly cellular (binuclear fraction) with no specific parenchyma zonation. To analyse whether polyploid profile is modified during liver tumorigenesis a cohort of patients surgically treated for HCC was selected (table 2). Out of 75 tumours analysed, 86% were male and 14% were female with the main risk factors being alcohol intake (27%), HBV infection (27%), HCV infection (27%) and metabolic syndrome (16%) (table 2). Tumours were mostly large with a mean of 71 mm and with macrovascular and/or microvascular invasion (53%) (table 2). Regarding tumour differentiation, 18% were well differentiated, 66% moderately differentiated and 16% poorly differentiated (table 2). Finally, in this series of surgically resected HCC, scores of fibrosis in non-neoplastic liver tissue were 27% F0-F1, 36% F2 and 37% F4, respectively (table 2). We first focused to define whether cellular ploidy changes during liver tumorigenesis. 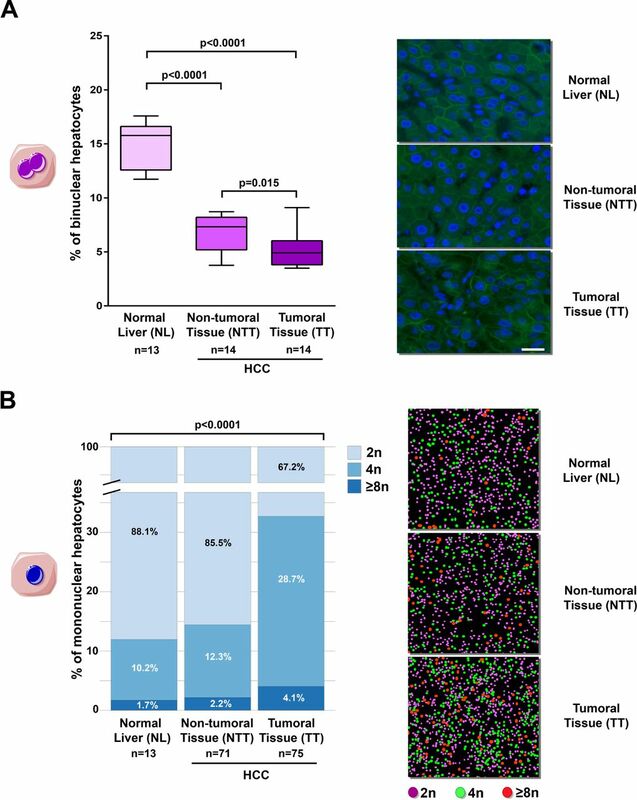 For this purpose, we quantified binuclear polyploid hepatocytes in resected HCC livers in both non-tumorous tissue (NTT) and tumorous tissue (TT). Our results showed that binuclear polyploid fraction is drastically reduced in both NTT and HCC TT in comparison to normal liver (figure 2A). This reduction is more pronounced in TT compared with the non-tumorous surrounding tissue (figure 2A). Notably, the ratio between binuclear fractions (2×2n/2×≥4n) was similar between normal liver, NTT and TT (online supplementary figure S2A). We next quantified the percentage of mononuclear fractions. The percentage of mononuclear 2n, 4n and ≥8n hepatocytes was equivalent in normal liver parenchyma and non-tumorous surrounding tissue (figure 2B). In contrast, the ploidy spectrum in HCCs was altered with more mononuclear 4n and ≥8n populations (figure 2B). To complement our results, we analysed the distribution of mononuclear 2n, 4n and ≥8n hepatocytes in both tumour and non-tumour samples. We observed a clear bimodal distribution of these populations, with TT being enriched in mononuclear 4n and ≥8n populations (online supplementary figure S2B). Finally, we confirmed as observed in normal liver that there is no modification of nuclear ploidy spectra related to ageing in NTT and TT samples (online supplementary figure S1). In summary, our data support the concept that binuclear polyploid fraction is drastically reduced during human liver tumorigenesis, and, conversely, mononuclear polyploid fraction is specifically amplified in HCC tumours. Cellular and nuclear ploidy spectra during human liver carcinogenesis. (A) Left panel: box plots for the percentage of binuclear hepatocytes (2×2n and 2×≥4n) relative to total hepatocytes population. The bottom, central and top lines of each box represent the first quartile, median and third quartile of the distribution, respectively (n=13 for normal liver [NL], n=14 for non-tumorous tissue [NTT] and HCC tumorous tissue [TT]). Values represent the mean±SEM. Data were compared using Kruskal-Wallis test. Right panel: representative magnification images (scale bar: 40 µm) highlight binuclear and mononuclear hepatocytes in NL, NTT and HCC TT. (B) Left panel: percentage of mononuclear 2n, 4n and ≥8n hepatocytes relative to total mononuclear hepatocytes in each group (NL, NLT and TT); n corresponds to the number of patients analysed. Data were compared using multivariate analysis of variance (MANOVA). Right panel: representative higher magnification images of nuclear ploidy spectrum (NL, NTT, TT). HCC, hepatocellular carcinoma. We looked deeper for correlations between nuclear ploidy spectrum and HCC features. First, we quantified the percentage of mononuclear polyploid hepatocytes (4n, ≥8n) within HCC according to differentiation grade. We observed that hepatocytes were 15.2% mono 4n and 1.7% mono ≥8n in well-differentiated HCCs, 28.8% mono 4n and 3.7% mono ≥8n in moderately differentiated HCC, and 43.1% mono 4n and 7.8% mono ≥8n in poorly differentiated HCC (figure 3A). Thus, remarkably, amplification of nuclear ploidy is related to HCC histological grade. We performed additional analyses in order to define whether modification of nuclear ploidy spectrum could be related to aetiologies (HBV, HCV, alcohol, haemochromatosis, metabolic syndrome). We found a significant increase in mononuclear polyploid fractions (4n and ≥8n) in HCC related to HBV infection (online supplementary figure S3). To go further, we defined whether modification of nuclear ploidy spectrum could be related to inflammatory infiltrates. We found a trend towards reduced diploid hepatocytes fraction and an increase in mononuclear polyploid hepatocytes in HCC with immune infiltrates (figure 3B). We finally identified whether amplification of nuclear ploidy could be assigned to a specific HCC genotype. Whole-exome sequencing has been performed on each HCC.25 26 The major mutations in HCC are TERT promoter (≈56%), CTNNB1 (≈36%) and TP53 (≈33%).26 27 Other mutations as ALBUMIN, AXIN 1, ARID1A and ARID2, affecting less than 15% of HCCs, contribute also to development of HCC. Table 2 recapitulates the ratio of these mutations found in our cohort (table 2). We observed that nuclear ploidy spectrum is not significantly different between HCCs mutated (M) or non-mutated (NM) for TERT promoter and CTNNB1, respectively (figure 3C) but also for ALBUMIN, AXIN 1 and ARID1A (online supplementary figure S4). For ARID2, we observed a slight reduction of nuclear polyploid fraction in mutated HCC (online supplementary figure S4). Notably, HCC mutated for TP53 had a specific ploidy spectrum with amplification of mononuclear 4n and ≥8n populations and in correlation a decrease in diploid fraction (figure 3C). 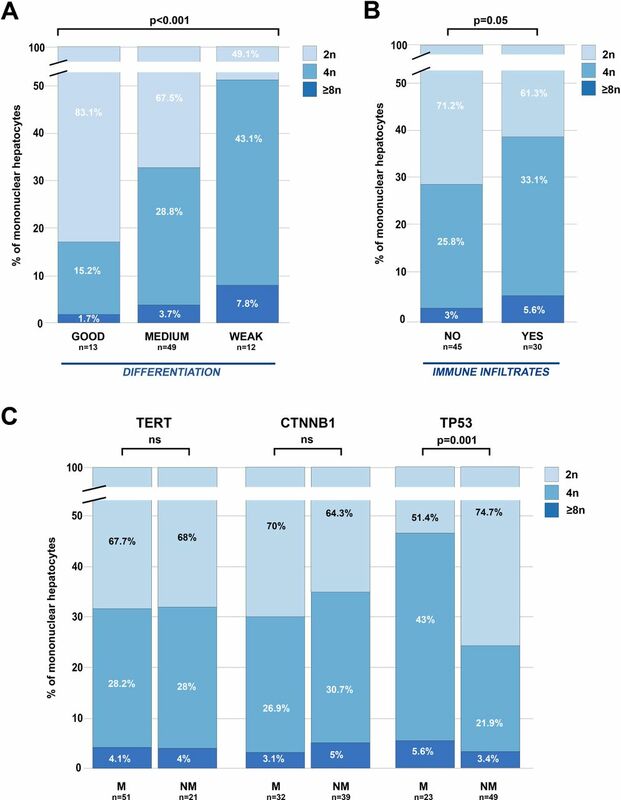 Multivariate analysis showed that TP53 mutation accounted for a higher percentage of mononuclear polyploid hepatocytes when compared with both TERT and CTNNB1 mutated tumours (online supplementary figure S5). These results revealed a difference in the spectrum of mononuclear polyploid distribution between patients with different histopathological and molecular features, and suggest that nuclear ploidy spectrum could be a useful parameter in redefining the HCC classification. Alteration of nuclear ploidy spectrum related to histological and molecular features of hepatocellular carcinoma (HCC). (A, B) Comparison of the percentage of mononuclear diploid (2n), tetraploid (4n) and highly polyploid (≥8n) hepatocytes in HCC tumours according to tumour differentiation (A) (good n=13, medium n=49 and weak n=12), to the presence of inflammatory infiltrates (B) (no infiltrates n=45, infiltrates n=30). (C) Comparison of the percentage of mononuclear diploid (2n), tetraploid (4n) and highly polyploid (≥8n) hepatocytes in HCC tumours mutated (M) or non-mutated (NM) for TERT promoter, CTNNB1 and TP53. n corresponds to the number of patients analysed. Data were compared using multivariate analysis of variance (MANOVA). ns, not significant. In other tissues, it has been demonstrated that polyploid tumour cells facilitate tumour progression, with these tumours being associated with higher rate of disease recurrence.28 In order to determine whether the nuclear ploidy spectrum may have a prognostic value in HCC, we used the density distribution of the proportion of mononuclear polyploid hepatocytes (4n, ≥8n) to define two groups of tumours: poorly polyploid (% polyploid hepatocytes <50%, n=49) and highly polyploid (% polyploid hepatocytes >50%, n=20) (figure 4A,B, online supplementary figure S6A). We observed that tumours with high polyploid content were significantly associated with a reduced 2-year and 5-year disease-free survival (DFS) (p=0.01 and p=0.02, respectively) compared with poorly polyploid tumours. These findings demonstrated the closed relationship between high DNA ploidy pattern and disease relapse in human liver (figure 4C). We next analysed an association with overall specific survival (OSS). These observations revealed only a trend towards full significance, probably due to the effectiveness of our cohort (online supplementary figure S6B). Correlation between nuclear ploidy spectrum and tumour growth rate was also determined. For this purpose, we used Spearman rank correlation to test possible relationships between the nuclear ploidy content and the expression levels of five genes related to cellular proliferation (MKI67, PCNA, CDC20, BIRC5, AURKA) which were assessed by qPCR. These genes are either global markers of proliferation (MKI67, PCNA) or identified as overexpressed in HCCs (CDC20, BIRC5, AURKA).27 29 Interestingly, we found a negative correlation between the diploid cell contingent and the expression of these proliferation markers (figure 5A). In contrast, the proportion of mononuclear polyploid cells (4n, ≥8n) was positively associated with the expression of the five genes (figure 5A). Finally, in line with our previous observations demonstrating that nuclear ploidy is amplified in HCCs harbouring TP53 mutation, we analysed whether there was a qualitative difference in the TP53 mutations in poorly and highly polyploid tumours. Both groups showed mutations at the classical hotspot at the codon 249, characteristic of aflatoxin B1 exposure (online supplementary figure S7). Interestingly, we observed that highly polyploid tumours showed an enrichment of TP53 mutations in the DNA-binding domain compared with poorly polyploid tumours (15/15 vs 4/7, p=0.02, Fisher’s exact test) (online supplementary figure S7). Altogether, our results highlight a clear association between nuclear ploidy spectrum and HCCs harbouring a low grade of differentiation, a high proliferation rate, TP53 mutations and a poor prognosis (figure 5B). We propose that nuclear ploidy spectrum could be an additional accurate test for human HCC prognosis. Patients with poorly or highly polyploid hepatocellular carcinoma (HCC) show a significant difference in disease-free survival. (A) Representative nuclear ploidy mapping of a poorly and a highly polyploid HCC (scale bar: 500 µm). T indicates HCC tumours, NT non-tumorous surrounding tissue. Mononuclear hepatocytes are coloured according to their ploidy class: purple 2n, green 4n, red, ≥8n. (B) Density plot represents the distribution of per cent of mononuclear polyploid hepatocytes (≥4n) in tumour tissue samples with the distinction of poorly polyploid HCCs (<50% of polyploid contingent) and highly polyploid HCCs (>50% of polyploid contingent). (C) Disease-free survival (DFS) probability (at 2 and 5 years) in patients with HCC tumours. Data were compared using Kaplan-Meier curves with log-rank test. Highly polyploid hepatocellular carcinomas (HCC) are more proliferative than poorly polyploid HCCs. (A) Corrplot showing Spearman’s rank correlations between the proportion of mononuclear diploid (2n) or polyploid (4n, ≥8n) hepatocytes and the expression of five proliferation markers in 68 HCC samples. Red circles indicate significant positive correlations. Green circles indicate negative correlations. Colour intensities reflect the rho correlation coefficient. (B) Poorly and highly polyploid tumours have different histological and molecular features. Figure summarising associations between the polyploid contingent of the tumour and the histological and molecular characteristics of 68 HCC samples analysed by qPCR. Samples are sorted into columns according to their proportion of polyploid cells (≥4n). Upper panel shows the associations with gene mutations and tumour differentiation grade. Statistical analysis was performed using Fisher’s exact tests and χ2 test for gene mutations and differentiation, respectively. Bottom panel represents the heat map showing colour-coded gene expression levels of five proliferation markers. Upregulated and downregulated genes are represented in shades of red and blue, respectively. Although polyploidisation is a part of normal development in some tissues, alarmingly in others transient polyploidisation is known to occur in tumorigenesis giving rise to aneuploid cells.1 2 6 30 A major challenge in this field is to understand whether the genesis of polyploid cells can be beneficial or detrimental to specific tissues. Remarkably, the liver is a unique organ that modifies its ploidy content during normal homeostasis, regeneration and damage repair.2 5 15 We know that hepatocyte ploidy depends on the DNA content of each nucleus (nuclear ploidy) plus the number of nuclei per cell (cellular ploidy). Whether or not polyploidy is a risk factor or is protective in liver cancer is still under debate. 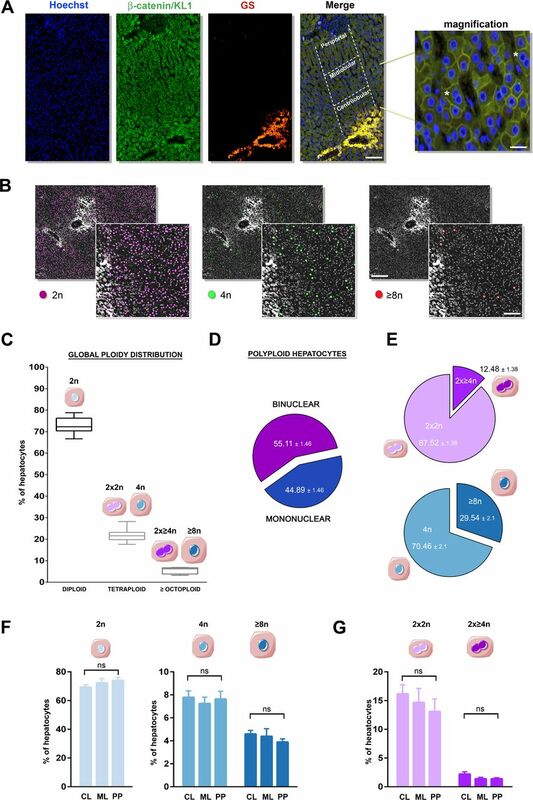 Here, we developed an in situ imaging approach to determine whether cellular and nuclear ploidy content is altered during human liver tumorigenesis. Finally, one of the major findings of our study is that nuclear ploidy spectrum is a marker of HCC aggressiveness. Interestingly, previous studies have described that HCCs were predominantly diploid.40–42 Here, for the first time to our knowledge, we compared polyploid spectrum according to histological and molecular features of HCC tumours. We first uncovered that nuclear ploidy is sufficient to distinguish between premalignant and malignant liver parenchyma. Furthermore, we demonstrated that mononuclear polyploid hepatocytes are enriched in HCCs harbouring low grade of differentiation, higher proliferation rate and poor prognosis. Interestingly, in multiple cancer models, the polyploid state presented tumour-suppressive functions; acquiring multiple sets of chromosomes functioning to buffer against gene inactivating mutations.30 43 44 In this line, an elegant study by Zhu and collaborators demonstrated in HCC murine models that polyploid state may be a gatekeeper of liver tumorigenesis.45 It is important to note that polyploidy protection was studied in a TP53 wild-type background.45 Of note, in different cancers, direct evidence of the oncogenic nature of polyploidy was demonstrated in a background of non-functional TP53 tumour suppressor protein.1 4 46 We suggested that in human liver parenchyma, polyploidisation could be a driver of HCC development at least in a TP53 mutated context. In summary, in this study we underline the importance of quantification of cellular and nuclear ploidy spectra during human liver tumorigenesis. We propose that the amplification of mononuclear polyploid hepatocytes might be a marker of HCC with poor prognosis. Future studies will discover whether these new insights could provide more clues for therapeutic strategies. We retrospectively included 75 patients who underwent surgical resection for HCC at Henri Mondor University hospitals. Exclusion criteria were R1 or R2 resection, extrahepatic metastasis at the time of surgery, preoperative antitumorous treatment, unavailable histological slides or follow‐up data, equivocal histological features suggestive of combined hepatocellular‐cholangiocellular carcinoma and inadequate material for histological analysis (necrosis >90%). The following clinical and biological features were systematically recorded: age, gender, liver disease aetiology (infection by HBV or HCV, alcohol intake, metabolic syndrome, hereditary haemochromatosis or undetermined), Barcelona Clinic of Liver Cancer stage, preoperative alpha-fetoprotein serum levels and follow-up (early relapse and disease-specific survival). Two pathologists specialised in liver diseases and blinded to the clinical and molecular characteristics independently reviewed all samples. Cases with disagreement were analysed using a multipipe microscope, and a consensus was reached. The following histological features were systematically assessed: tumour differentiation (according to Edmondson-Steiner grade), fibrosis stage (assessed with the METAVIR scoring system47), macrovascular or microvascular invasion, tumour capsule and inflammatory infiltrates. The definitions of early, small and progressed, classic and poor prognosis HCC were based on the histological criteria for HCC proposed by the International Consensus Group for Hepatocellular Neoplasia. Small and progressed HCC was defined by a distinctly nodular lesion with a diameter ≤2 cm and well-differentiated (G1) to moderately differentiated (G2) histological features, with malignancy recognised at first glance; no portal tracts were detectable. Poor prognosis HCC was defined as HCC case displaying recurrence within 2 years. Classic HCC was defined as non- early, non-small, non-poor prognosis HCC. 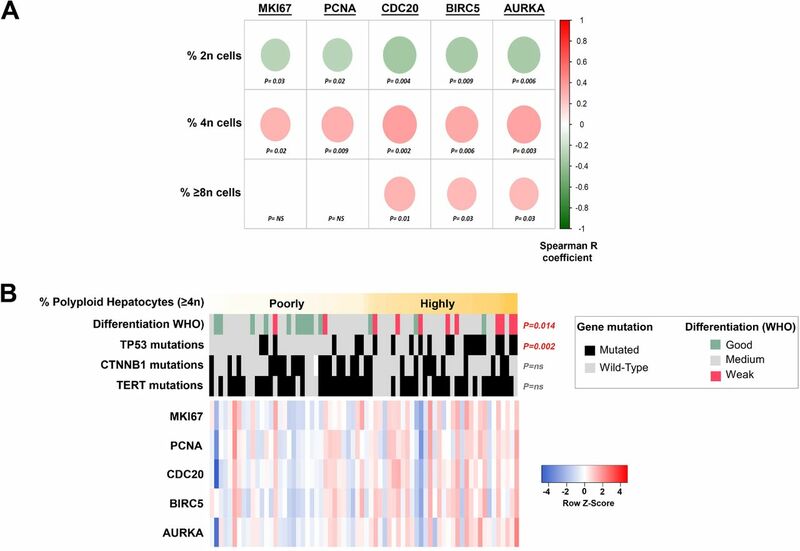 For genetic features, we extracted data from our former whole-exome sequencing study and selected genes mutated (TERT promoter, TP53, CTNNB1, ALBUMIN, AXIN1, ARID1A, ARID2).26 Control patients (n=13) underwent liver resection for benign tumours. All patients gave their written informed consent in accordance with French legislation. Liver sections (5 µm) were deparaffinised and incubated in citrate buffer at 95°C for 20 min for antigen retrieval. Sections were incubated overnight at 4°C with the primary antibodies including anti-β-catenin (1:200 dilution, BD Biosciences, 610154), anti-pan keratin C11 antibody (1:200 dilution, Cell Signaling, 4545) and GS antibody (1:200 dilution, BD Biosciences, 610518). Anti-mouse or anti-rabbit IgG antibodies (1:500) conjugated with Alexa Fluor 488 or Alexa Fluor 594 (Thermo Fisher) were used as secondary antibodies. Hoechst 33342 (0.2 μg/mL) purchased from Sigma-Aldrich was included in the final wash to counterstain nuclei. All images were collected with the slide imager NanoZoomer 2.0-HT (Hamamatsu). For nuclear ploidy, we developed a method implemented from ImageJ (Rasband, WS, ImageJ, US National Institutes of Health, Bethesda, Maryland, USA, https://imagej.nih.gov/ij/, 1997–2016) to infer ploidy from Hoechst staining. Ploidy classification was based on the diameter of the hepatocyte nuclei. Nuclei were stained by Hoechst and automatically detected and their area (pixel2) was assessed as previously described.18 20 21 First, we extracted the area of each nucleus and fit a Gaussian mixture model to the distribution of nuclear diameters. We selected nuclei according to their nuclear circularity (≥0.7). Nuclei of non-epithelial cells present a lower circularity. Second, we designed thresholds to separate the different populations, located between areas of 30–60 pixel2, 65–90 pixel2 and 95–500 pixel2 to separate the 2n, 4n and ≥8n nuclei, respectively. Nuclei with an estimated area <30 pixel2 or >500 pixel2 were excluded (neither non-hepatocytes population nor incorrect Hoechst segmentation). Each region of interest is assigned to a specific colour: 2n nuclei/purple, 4n/green and ≥8n/red. For each patient, around 500 000 nuclei were analysed. For cellular ploidy, mononuclear and binuclear fractions were quantified on 10 random high-power fields (about 5000 cells) on scans of stained liver sections. We assessed mRNA expression levels in 68 HCCs and five normal liver tissue samples. Total RNA from frozen surgical samples was extracted using Maxwell 16 LEV simplyRNA Tissue Kit (Promega). Reverse transcription of 500 ng of total RNA was performed using the High-Capacity Transcription Kit (Thermo Fisher Scientific). Then, expression levels of five proliferation markers were assessed using specific TaqMan predesigned assays (Hs01032443_m1, Hs00696863_g1, Hs00415851_g1, Hs00153353_m1, Hs01582073_m1; Thermo Fisher Scientific) on Fluidigm 96 Dynamic Arrays with the BioMark Real-Time PCR System. The relative amount of RNA was calculated with the ΔΔCT method using 18S ribosomal RNA and the expression level of the corresponding gene in five normal liver samples. Statistical analysis and data visualisation were performed using R software V.3.3.2 (R Foundation for Statistical Computing, Vienna, Austria, https://www.R-project.org) and Bioconductor packages. Continuous variables were compared using non-parametric Mann-Whitney U test or Kruskal-Wallis test to compare two groups and more than two groups, respectively. Analysis of multivariate data was performed using a multivariate analysis of variance with semiparametric designs in order to avoid the assumptions of multivariate normality and covariance homogeneity. Correlation analysis between continuous data was performed using Spearman’s rank-order correlation. Qualitative data were compared using the Fisher’s exact test to compare two groups and Χ2 test to compare more than two groups. Univariate survival analysis was performed using Kaplan-Meier curves with log-rank statistics to assess the difference in 2-year and 5-year DFS and overall survival (OSS) in two groups. A p value <0.05 was considered statistically significant. We thank the Tumor Biobank of Henri Mondor University Hospital and the Réseau National Centre de Ressources Biologiques (CRB) Foie for contributing to the tissue collection. We also thank the facilities of Cochin Institute (Histology, Immunostaining, Laser Microdissection [HistIM], Imaging Facility of Necker Institute and Imaging Photonic [IMAG’IC]) and CHIC (Center of Histology Imaging and Cytometry) facility of the Centre de Recherche des Cordeliers. Finally, we thank Benedict E Monteiro for the English language editing of this manuscript.
. aneuploidy and cancer. Curr Opin Genet Dev2007;17:157–62.
. Polyploidization of liver cells. Adv Exp Med Biol2010;676:123–35. RD and SC-M contributed equally. MB-N and SC contributed equally. Contributors MBN designed, performed and analysed the experiments, compiled the figures and wrote the manuscript. SC analysed the experiments, compiled the data with statistical analysis /designed the figures and wrote the manuscript. JC designed and analysed the experiments, and compiled the data. RD, GG, CM, LA, TG, CK, MA and GC performed experimental research. VP and JPC analysed the data and provided critical help on the manuscript. SCM analysed the data, designed the figures and provided critical help on the manuscript. JZR analysed the experiments, funded the project and provided critical help on the manuscript. CD designed and performed the experiments, analysed the data, funded the project and wrote the manuscript. Funding This study was supported by grants from the Institut National de la Santé et de la Recherche Médicale (INSERM), the Institut National du Cancer (PRTK-2017, PLBIO 2018-140), Fondation ARC (Association de Recherche sur le Cancer), Ligue Contre le Cancer (Comité de Paris), the Cancéropôle Ile-de-France (Emergence 2015), The Association Française pour l’Etude du Foie (AFEF-SUBV 2017), EVA-Plan Cancer INSERM HTE and the Agence Nationale de Recherche ANR (ANR-16-CE14).